I hope you’re all having a great weekend. It was sunny over here the whole day long. 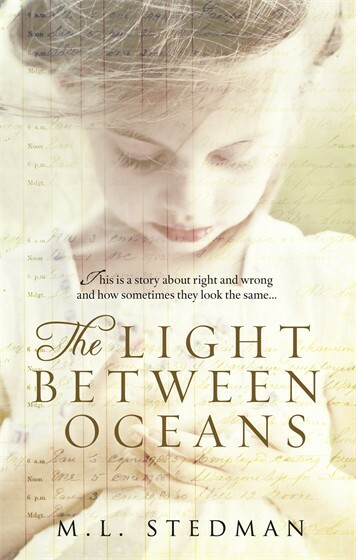 And on this beautiful autumn day, I have a review of M. L. Stedman’s The Light Between Oceans for you. This is such a wonderful book. I finished reading just before I went to Frankfurt. The main setting for The Light Between Oceans are the fictitious town of Point Partageuse on the west coast of Australia and Janus Rock, a small, and also fictitious, lighthouse island. The story is set in the first half of the 20th century. Through her descriptions, M. L. Stedman is able to make beautiful scenes come to life. I soon felt at home in this world accompanied by the constant sound of the sea. The main characters are the married couple Isabel and Tom, and Hannah, who is of importance later in the novel. It is remarkable how each character’s feelings are transplanted into the reader’s heart and soul. It’s not surprising that in the course of the book, you will change your mind about a character that you have liked, or not liked before. You can feel the happiness, the pain, the grief. M. L. Stedman truly knows how to craft characters. I really enjoyed the unique plot of The Light Between Oceans. Every time you think the story might get predictable something unexpected happens that turns things around. Stedman has thought about many details that, like in real life, can have a big impact when they interact. The Light Between Oceans is like a glimpse into the main characters’ souls. A deeply touching novel that will lead you into a world full of yearning and hope. < Previous Frankfurt Book Fair – We’re Back!